Even the most talented, creative, brilliant writers won’t go far unless they know how to overcome the discouragement of getting rejection after rejection! Talent and creativity isn’t nearly as important as stick-to-it-iveness. 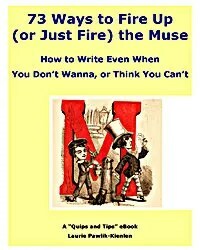 The following tips for overcoming discouragement and constant rejection are from my ebook, 73 Ways to Fire Up (or Just Fire) the Muse. It contains tips from successful freelancers, published authors, journalism professors, and novelists — it’ll give you more motivation to write than you know what to do with! You don’t want to look back on your life and see how scared you were. You want to look back and be proud that you tried…no matter what the result. Robbins suggests finishing this sentence: “My fear of succeeding in this writing project is…..” It may help you see the real reasons behind your procrastination. Sometimes when you look into the jaws of the beast, you see it’s toothless. He says this simple advice has been crucial in his ability to overcome the fear of the blank page, as well as the dozen other neuroses that plague him. “It’s taken me years to get good at it, but it’s the best tool in the box,” he says. “The mere act of doing usually makes the fear recede in just a few minutes.” Pretend, just for a moment, that rejection or failure isn’t the end of life as you know it. Writing is a business, my friends. A fantastic nonfiction book or novel idea can be unsuitable for a literary agent’s list. A magazine editor could love your article pitch, and put it aside for a future issue and then forget all about it. A book publisher may be enchanted by your book proposal, but not have enough money, time, or resources to publish more than the scheduled book list. There are a gazillion reasons for a rejection from the publishing world – and few that reflect on your ability as a freelancer. This automatic system shifts your focus from how you feel to what you can do. For more tips on overcoming discouragement and rejection for writers, read How to Increase Writing Confidence – Grow the Skin of a Rhino. If you’re a poet, read Selling Poetry? 5 Ways to Market Your Book of Poems by Cherie Burbach. It’ll inspire you to keep writing! What do you think, fellow scribes? How do you keep writing despite fear, doubt, and self-criticism? Thanks for your comments! Aside from learning how to be a better writer, knowning how to overcome the discouragement that comes from rejection is the key to success. It takes 25 years to be an overnight success, after all. These are terrific ways to motivate writers to keep writing and not be discouragd. Thank you for the inspiration! Good tips. Often a rejection is not an indication of the quality of your work. Some journals take only 2% of what they get and so they have to turn down a lot of good writing, or your writing style doesn’t fit with the magazine/journal. If you keep submitting, you often eventually luck out. There will be those looking at rejection as failure. To me, I see it as motivation to improve what I’m doing. From rejection, you get some of your best criticisms as to what you are doing wrong. You learn and improve! You are absolutely correct. A determined writer should find ways to overcome discouragements and boost his or her confidence. Thanks you the tips you have shared in your article. This is always a tough one. I put in over an hour to create a crafted email only asking a few questions about the publishing company. I received a simple response: so and so is not accepting submissions at this time. Of course none of the questions were answered. Great tips. Certainly, it can be quite discouraging at times, but a good writer should use your tips to overcome those discouragement and rejection! Thank you for this post. I was really up to give up writing. You helped me in these hard times Thank you. Thanks for sharing these tips for overcoming disappointment and rejection with us, Laurie. I agree that talent and creativity doesn’t matter nearly as much as dedication and perseverance. How many writers have finished books in their desk drawer, too scared to send them out? Most, I bet. Good for you for sending your past writing! But, the only thing worse than taking risks is NOT taking them. Better to have tried and regretted, then never to have tried at all. Let me know how it goes; I’d love to hear how the world responds to your article. This post came at a good time for me. I have been spending the past couple of days reading some of my old writing. Those articles and stories which I wrote in the hope they would see the light of day and which never did. In most cases I wrote them and then decided they were not good enough to pitch to a magazine.Actually, having reread them and with a few years experience under my belt I realise they are good enough. I just need to be brave enough to send them. In fact one of them is going to see the light of day today and I will see what the market thinks of my little article.No harm in trying! I also think one of the most important tips is to learn how to enjoy the process of writing, without the goal of getting published. Publication is amazing and excellent, don’t get me wrong, but if it’s your primary or only motivation for writing, then your well will run dry if you don’t get published. If, however, your love for writing, your creative spark, or your desire to express yourself is your primary motivation, then you’re less likely to stop writing if you don’t get published.